A corporate software product that allows flexible customization to your requirements, in many cases even without code change. We vouch for the functionality of our software. However, if there is something that doesn’t work smoothly, you can rest assured that we will look after it. Processing mass data while you continue working with your ERP software is a walk in the park with metasfresh. Become a part of our open source community and actively participate in promoting the metasfresh innovations with your expertise. We will be at your side. Install and use metasfresh wherever you want to, as often as you like. Feel free to change metasfresh or have it changed if it doesn’t suit you. metasfresh comes with a variety of fascinating features. Our hands-on trainings at your offices and online webinars cover them all, so that you can get to know them in practice. With intuitive user guidance and a clear user interface we help the users of metasfresh to get their bearings quickly. We don’t sell software licenses. Instead, we solve our clients’ problems. Customer service is what we love and live for. It’s our daily bread. Do you have questions regarding our metasfresh software or do you need technical assistance? We offer diverse support packages to help you fast and reliably. We develop open source software as this is the most efficient, innovative and cost-saving way to meet our customers’ needs. 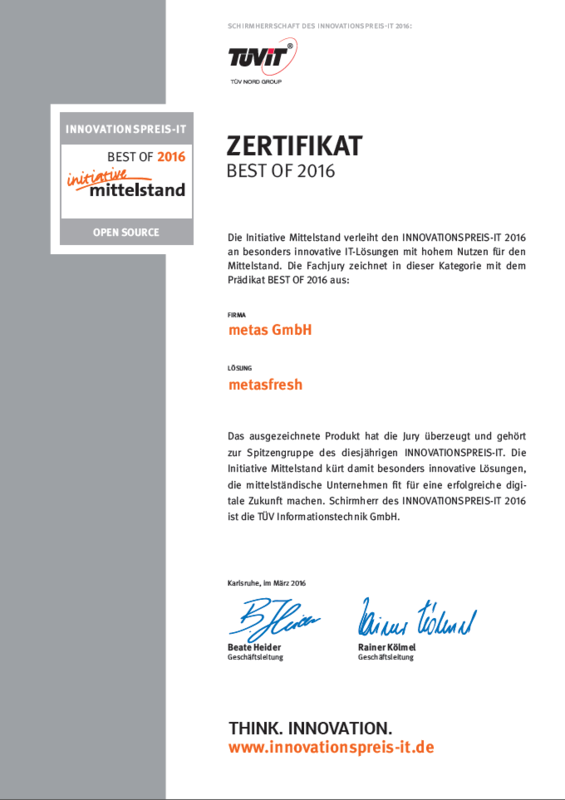 metasfresh is one of the best solutions in the category open source for the innovation award 2016 granted by “Initiative Mittelstand”. Our open source ERP solution metasfresh was qualified for the final round and now belongs to the best of this category. Our team is very happy for being among the finalists. The independent, high-level expert committee is made up of professors, scientists, industry representatives and business journalists. Since 2004, Initiative Mittelstand honors innovative IT solutions with the annual IT innovation award during the CeBIT. The easiest and most comfortable way to familiarize yourself with metasfresh without any obligation. Sign up today for a webinar. Would you like to install metasfresh yourself and try it out locally in your offices? Simply download, install and get started! Get your free online version of metasfresh within minutes! metasfresh is a friendly-fork of ADempiere 3.54 with all the advantages of open source software development, enhanced by a variety of features for the wholesale and fresh produce sector, with services such as quality assurance, training, warranties and planning reliability for our customers. ADempiere ERP is an open source community project created as a fork of the ERP software Compiere in 2006, developed since 1999. With more than 1 million downloads, ADempiere is one of the most successful ERP systems in the world. In its Open Source Survey Switzerland 2015, the Institute for Information Systems at the University of Bern, Switzerland, has identified the key reasons for using open source software. Just set up a chart of accounts and metasfresh takes care of your accounting needs – quickly and easily. How many users does metasfresh support free of charge? An unlimited number of users. metasfresh is royalty-free and can be installed for and used by as many users as you need. If you have a support agreement with us, we charge the agreed fee per user. Can I get a metasfresh demo to try before I buy? We regularly offer metasfresh online demos to get an overview of the features without any obligation. Are you interested? Sign up now to participate in the next demo session. How long does it take to implement metasfresh in my company? That varies from case to case and highly depends on the size of your business, data migration tasks where necessary, as well as the required features and the corresponding training. Feel free to contact us for a free initial consultation without any obligations. I can’t afford failure of my ERP system for extended periods. Do you provide fast response times? Yes. We offer response times starting at 15 minutes per chat channel. Depending on your individual agreement you can even use our 24/7 telephone support service. Is metasfresh suitable for any type of business? metasfresh offers a variety of features that allow for its efficient use in many different types of companies. 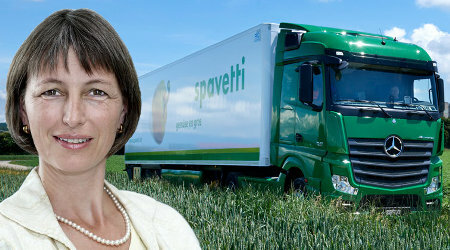 However, our key customers include businesses in the wholesale and fresh produce sector. Where do I get support for metasfresh? We offer technical support for metasfresh ERP. That’s our daily bread. The price for this service depends on the number of users and the agreed support hours. Support can be provided at various levels up to 24/7 support if required. I expect an ERP supplier to offer a warranty. Can I count on that? Sure you can. We provide all our support agreement customers with a guarantee of proper functioning for enabled features. In the unlikely event of faults, we will correct these quickly and reliably. What is the reason for developing metasfresh under an open source license? We are no software vendors. Instead, we are dedicated to solving problems, improving processes and aiming at facilitating and accelerating corporate growth for our customers. We believe that development under an open source license is the most innovative and efficient way for achieving that goal.